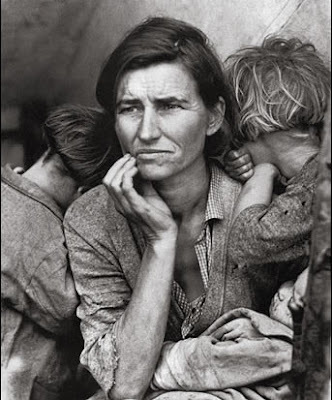 "Migrant Mother", one of the USA's most famous pictures, was taken in February or March of 1936 by Dorothea Lange. Pictured are Florence Owens Thompson, then 32 years old, and her children who are now grown. Katherine, who is the girl to the left burying her face in shame in this picture, was interviewed this week by CNN. Click here for more. As economic uncertainty once again grips the USA we'll see more references to the great depression - the worst economic time in the history of the USA with terrible conditions that extended to other countries. Thankfully, most experts think the US won't face depression era conditions even as conditions become worse.